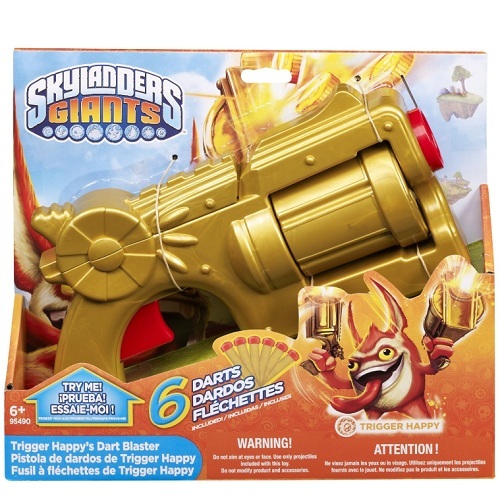 Product Detail Summary: This Skylander's Dart Blaster is a must-have for any fan, young or old! Trigger Happy's Dart Blaster is a multi-chamber dart launcher. Includes 6 darts. Ages 6+ adult supervision suggested. Become your favorite Skylanders Giants™ hero and let your pistol do the talking with Trigger Happy’s Dart Blaster by Mega! Wag your tongue wildly and defend Skylands from the forces of Kaos with this detailed replica of Trigger Happy’s Gold Coin Shooter. A six-shot barrel, six darts and a loose trigger finger will give evil minions the message that messing with everyone’s favorite cackling gunslinger is no laughing matter!